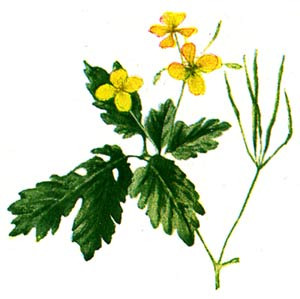 Chelidonium Majus (greater celandine; in Europe tetterwort, although in America the same name refers to bloodroot) is an herbaceous perennial plant, the only species in the genus Chelidonium. It is native to Europe and western Asia and introduced widely in North America. The lesser celandine belongs to the same order (Ranunculales) as the greater celandine, but belongs to the buttercup family, whereas the greater celandine belongs to the poppy family. Greater celandine has an erect habit, and may reach 30 to 120 cm high. The leaves are lobed and crenate, 30 cm long. The sap is yellow to orange. Chelidonium is a prominent liver remedy which covers many of the symptoms of diseased conditions of that organ. This remedy is used for liver and bile disorders such as gallstones, indigestion, jaundice, and hepatitis. People needed this remedy may feel heaviness, with pain symptoms tending to be right-sided. When ill, people who need this remedy feel generally "liverish" or nauseous, and depressed with a dull headache. They have a sallow, yellowish complexion. One foot may feel hot and the other cold. Cravings for hot drinks or cheese make them feel better. Chelidonium helps heal the liver organ naturally. It helps get all of the liver functions back on track.